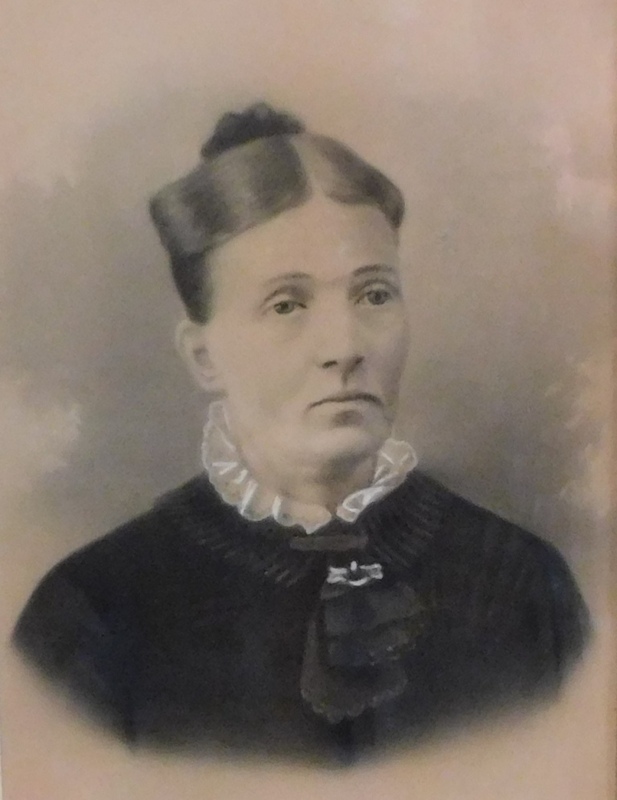 Now that you’ve seen the Christmas tree we associate with her, I’m going to share more information about the story of Aunt Margaret—whom I never personally met, by the way. But as I sit here in the evenings, enjoying her Christmas tree, I ponder her life and her connections to Sue, to her family, and by extension to me. 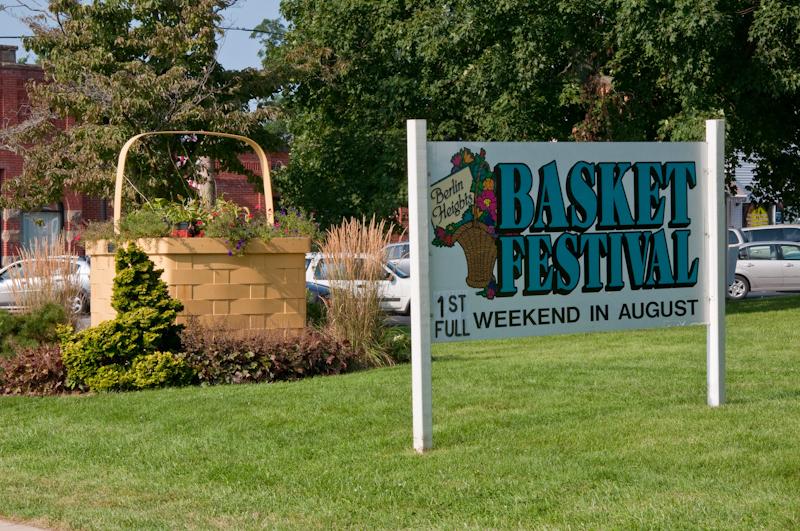 Berlin Heights, Ohio, is a small town with a deep and fascinating history. And Sue’s great aunt Margaret seemed to be an interesting, intelligent woman. You want to read more, don’t you? Here’s a portrait of Armina Baumhart. Sue described Aunt Margaret as no-nonsense, direct, opinionated, and very smart. And although she was not extravagant, she recognized quality. Let’s start this story at about the turn of the century. Margaret was the baby of her family. 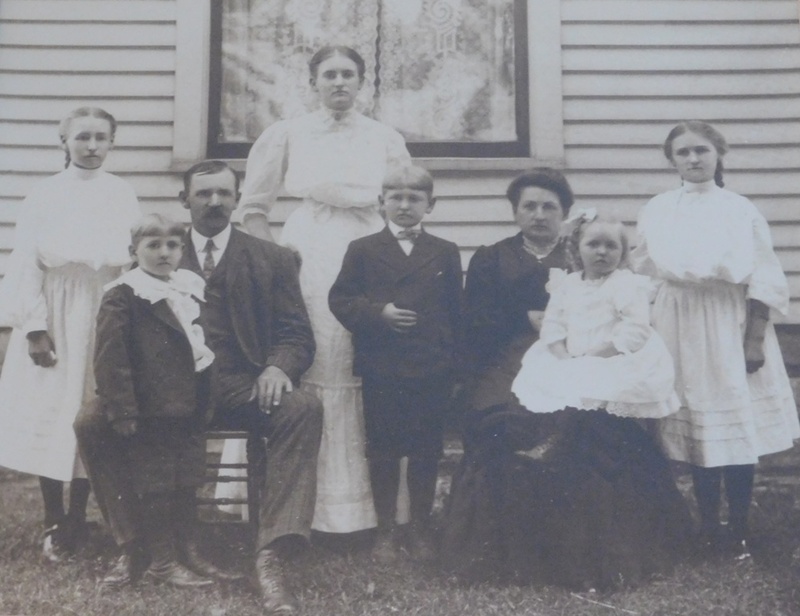 Her father was Henry Ferber (seated) (Sue’s great-grandpa). Margaret had five brothers and sisters, including Sue’s grandpa, Nelson (standing in front of his father). Her sister Mabel Ferber (more on her below) is standing at far left. Margaret’s sitting on her mom’s knee. Sue thinks Margaret was probably the only one of her siblings to go to college. (Ohio State—go Buckeyes!) Her higher education was cut short, however, when her dad (Henry Ferber) died in 1923, and she had to go home, back to Berlin Heights. If you look at a map of Ohio, the northern edge forms a shallow U shape. About four miles inland from the very bottom of that U is Berlin Heights (pronounced BURR-lun). 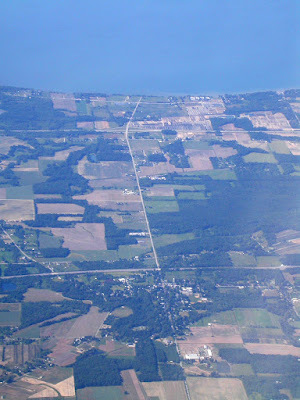 Here’s a picture of BHOH we took from a jet in 2006. At the top is Lake Erie/north. Ohio Route 61 runs down the middle of the image. There are two prominent east-west highways. The one toward the top, with the visible exit ramps where Route 61 bends, is Route 2; moving down, the other east-west highway is the Ohio Turnpike. Berlin Heights is the buildings and homes clustered on both sides of Route 61 just south of the turnpike. Margaret’s story is closely connected with that of her brother Nelson (Sue’s grandpa). Nelson pursued farming, like his dad and grandfather. 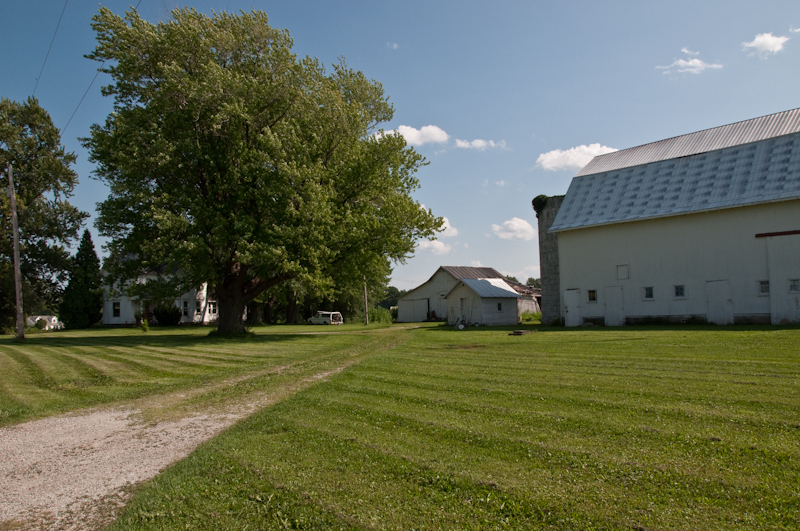 Nelson and his wife, Mabel (Sue’s grandma), rented the family farm in 1928, then bought it in 1929. 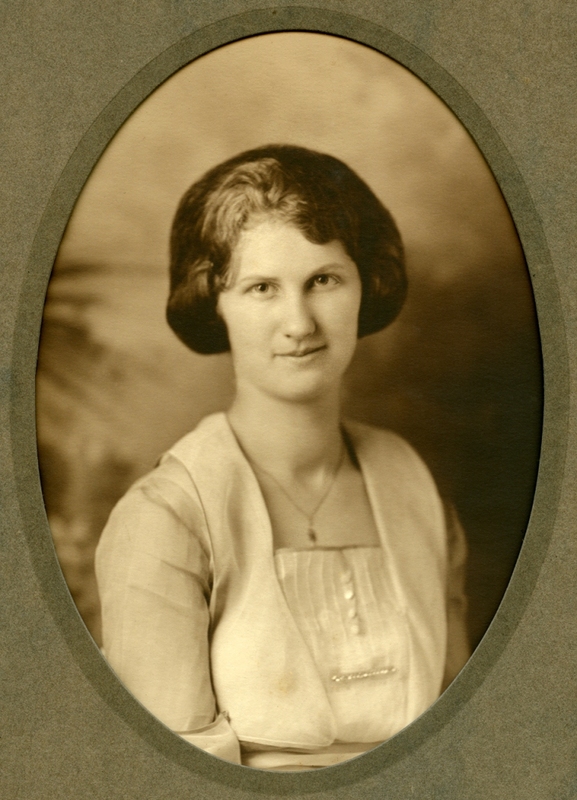 Here's a portrait of Mabel Ferber, Sue's grandmother, and Margaret Nottke's sister-in-law. Are you ready for a sad story? In July of that year, 1929, the Ferber farm’s enormous barn caught fire and was destroyed (along with the horses in it). Sue’s aunt Nelly, the eldest of the couple’s three daughters, was the first to notice and sound the alarm, and she witnessed the entire thing. Absolutely devastating . . . but wait, it gets worse. The decision was made to rebuild the barn—a majestic thing—at great expense, with huge 8 by 8 beams joined together with wooden pegs. It and the big old Ferber farmhouse are still standing, east of Berlin Heights, on the southwest corner of East Main (Rt. 17) and Wright Road (Rt. 138). You can just see it from the Ohio Turnpike.
. . . How many things might have turned out differently if they had not incurred this debt? So Sue’s grandparents had the loan for rebuilding the barn as well as the mortgage. They couldn’t have picked a worse time to go into debt: Black Tuesday was October 29 of that year. Farmers all over America were devastated by the Great Depression, but it was extremely hard on this family. Mabel Ferber’s diary from 1932 is heartbreaking, in large part because she spent so little time writing about her feelings. She mainly wrote about all the hard work they did—and only occasionally commented on the hopelessness of their situation. So, as the depression had deepened, the couple finally produced a son. Sue’s dad was born in February 1932. Though “Sonny” struggled to gain weight at first, he finally pulled through . . . But the family's challenges were overwhelming. That winter, they all kept getting colds, but they all kept working anyway. And then Mabel died in December of that year. (I told you her 1932 diary is a poignant read; you can’t read it without knowing that its writer was experiencing her last year of life.) By then, the foreclosure was already in process. By the end of that winter, Sue’s grandpa Ferber and his four children had left the farm. The man who had loaned him the money to rebuild the barn—a cousin, in fact—foreclosed on him in early 1933. Aunt Margaret and Uncle Stub are mentioned a lot in Mabel Ferber’s diary. 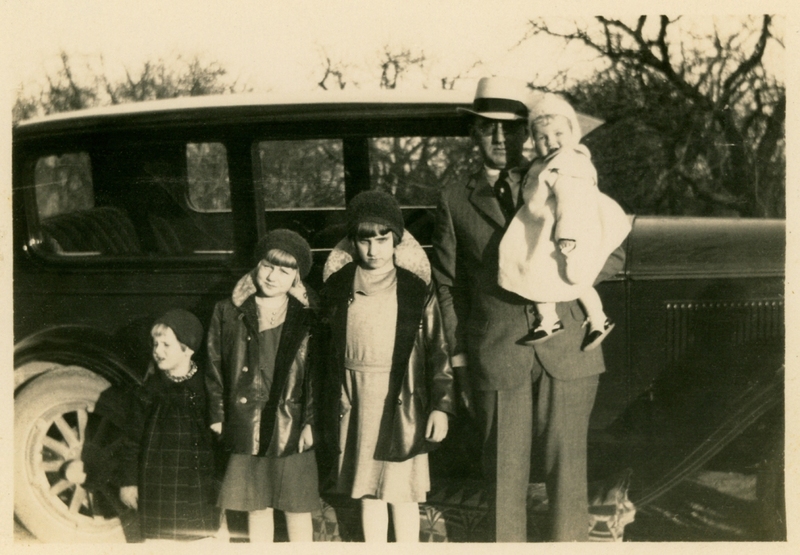 The family was close, and during the depression they were all pulling for each other. After Mabel’s death, the four children, including Sue’s father, an infant, didn’t have a clear place to live. Here's a photo from 1933, taken sometime after they'd lost the farm. Their dad was focused on finding work. So in the first few years of his life, Sue’s dad, in particular, was cared for by a variety of relatives—on his mom’s and dad’s side. For example, he was often cared for by his aunt Mabel and uncle Clarence Nottke, who had a mom-and-pop grocery store in Florence, on the southwest corner of the intersection of East Main (Rt. 17) and the Florence-Wakeman Road. That building’s still there, too. I guess it’s an apartment building now.
. . . 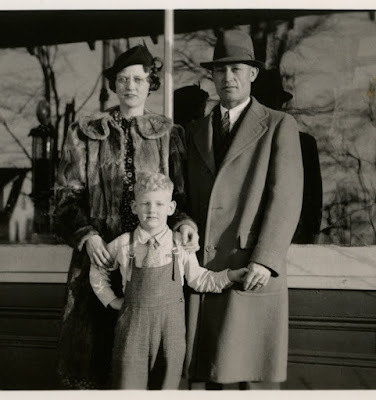 Anyway, here’s a fun aside: So, Aunt Mabel and Uncle Clarence Nottke often cared for Sue’s dad when he was a little boy. They lived above their store in Florence. Sue’s dad remembers that when he would stay with them, they’d sometimes cut off a small wedge of cheese to eat as a snack before bedtime. . . . Sue wonders if even today—when the humidity’s just right—that building might still smell of cheese, milk, and dry goods. Back to the story. Eventually, Margaret and Stub started caring for Nelson full-time, apparently when he was about three (or before he started school, anyway). They never had any children of their own. This picture, by the way, was taken in front of Clarence and Mabel's store in Florence. But Stub and Margaret didn’t officially adopt their nephew Nelson; and they didn’t let him forget who his real dad was. He never called them “mom” and “dad.” At holidays and in summers, he went to stay with other relatives. 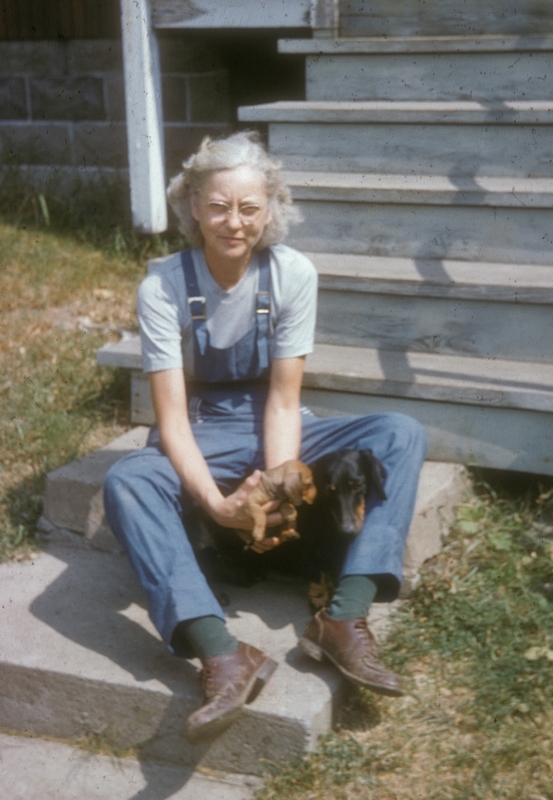 Sue’s grandpa Ferber was forced into new work, first farming near Vermilion, later becoming a logger and lumber seller. 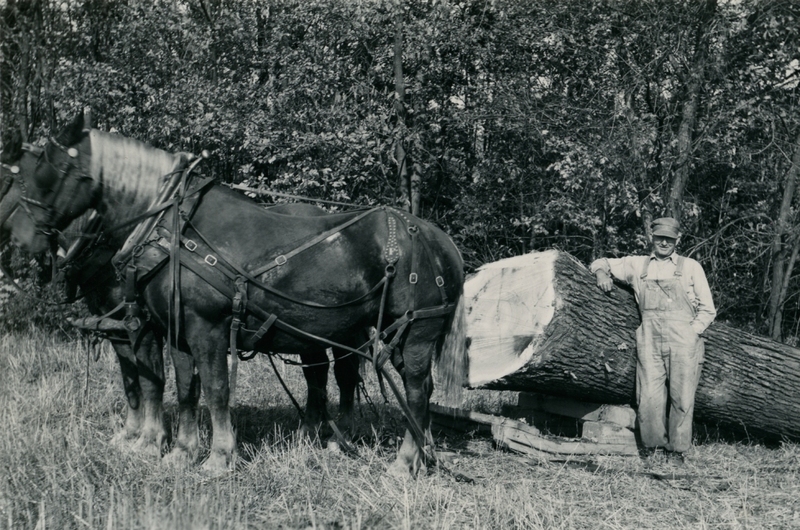 He worked with a team of draft horses and a big wooden sled for hauling boles out of the woods. He remarried rather soon after Mabel’s death, and no one seemed too fond of his second wife, Cora. I guess that was because she wasn’t warm to her husband’s family. And Grandpa Ferber himself had grown increasingly, um, crusty. He’d always been short-tempered, and the disasters he experienced certainly didn’t help his disposition. So Sue’s dad grew up with his aunt Margaret and uncle Stub, and Sue and her sister and brother grew up with a great aunt and great uncle who were, more or less, their paternal “grandparents.” They were certainly emotionally closer to them than to their father’s own father. What did the Nottkes do? 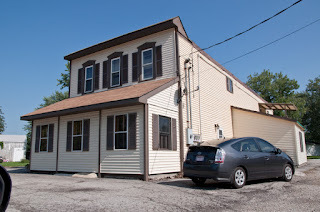 Well, for about one year, they had a dry goods store at the center of Berlin Heights, on the northeast corner of Main and Lake streets, where the town’s U.S. Post Office is now. Maybe they did this with the encouragement of their siblings/in-laws, Clarence and Mabel, who had the store in nearby Florence. Anyway, they got out of that business; apparently they just didn't care for that kind of business. So mainly, Uncle Stub worked for the Lake Shore Electric interurban railway line, which went through Berlin Heights through what is now the field behind Sue’s parents’ house. Stub must have been employed in some form of maintenance—either of the cars, the line, or the station. The interurban was a big deal in its time, offering people in small towns fast, convenient travel to Cleveland, Toledo, and Detroit. 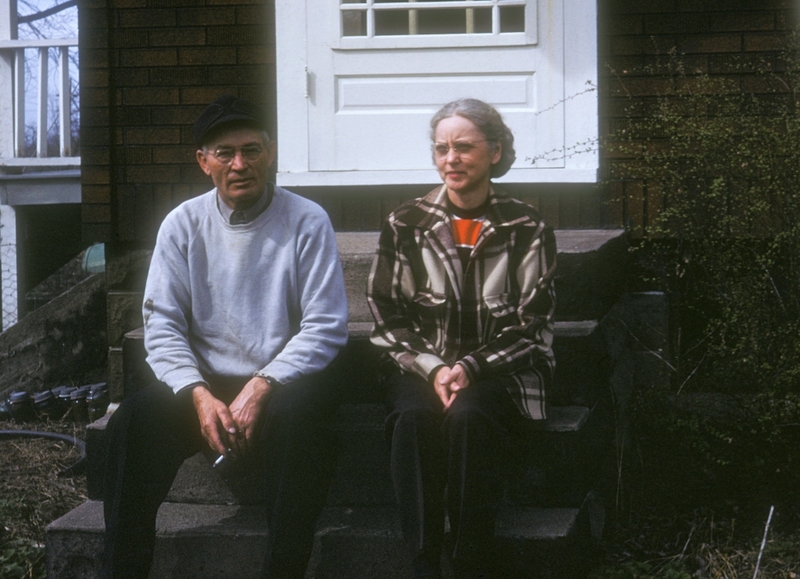 When the interurban declined and closed in 1938, Uncle Stub found other employment; Sue remembers him working for Ohio Edison—as a lineman, she thinks. Here they are in 1956. And Margaret worked, too. 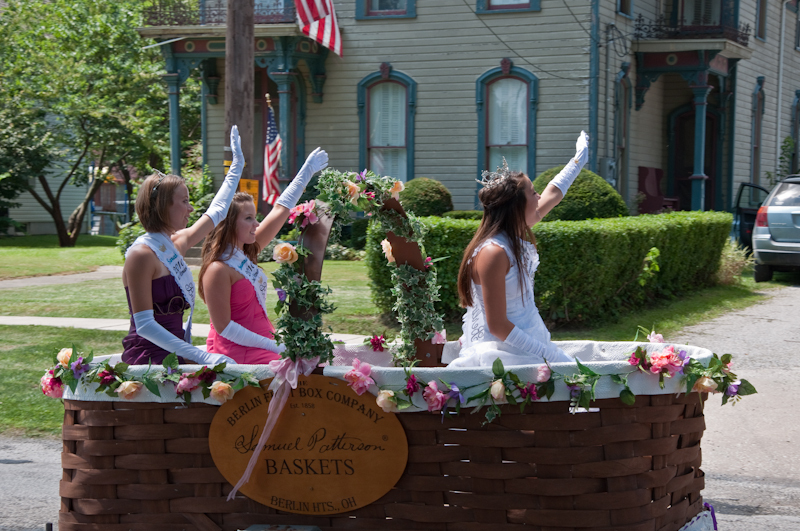 She worked for many years at the Berlin Fruit Box Company, which all the locals called “the box shop.” For more than 150 years, this basket factory was the town’s main industry. It started in 1854 making bushel, peck, and pint baskets, crates, ladders, and other items needed for harvesting and shipping apples and other fruit and vegetable crops. 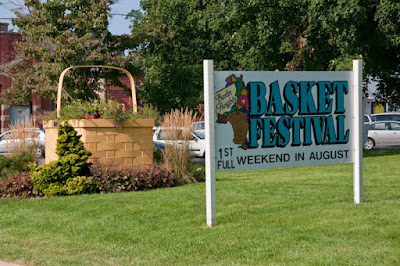 The basket factory, at 51 Mechanic Street, was just up the road from the Nottkes’ home at 13 Mechanic Street. This was their lathe/veneer-making machine; Sue took the photo in November 2004 when we took a tour of the then-revitalized factory. The basket theme still fits, since the community has a thriving orchard-based economy, including Burnham Orchards, Quarry Hill Orchards, and AB Phillips & Sons Fruit Farm. 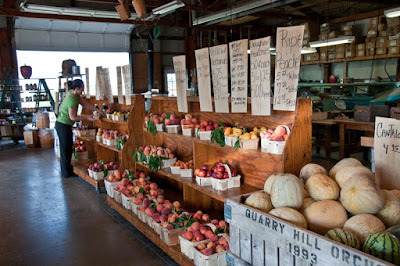 So as Uncle Stub worked at the interurban and at Ohio Edison, and Aunt Margaret wove together thin strips of wood and stapled them together into baskets for the region’s produce, Sue’s dad grew up kind of a latchkey kid. Maybe to help make up for not being home all the time, Aunt Margaret was rather stern with her nephew, her young charge. Apparently she was a stickler for manners—sitting up straight, behaving appropriately at the dinner table, cleaning your plate, and so on. (For ever after, Sue’s dad, I guess, never did feel very comfortable at fancy places, where there were cloth dinner napkins and tablecloths!) 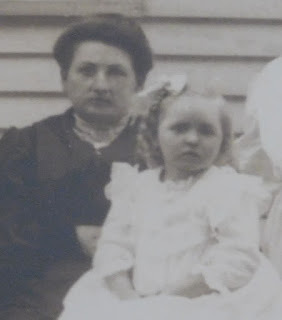 Margaret wouldn’t tolerate shenanigans from Sue and her siblings, either. If they started misbehaving, she’d send them right home. But they loved her anyway. So, now you know a little about Sue’s great aunt Margaret, who is forever remembered with this beautiful aluminum Christmas tree. If she was a little stern, if she was opinionated and direct, if she had a low tolerance for nonsense—you just have to remember what she went through, and what she witnessed. Somehow this tidbit seems to encapsulate what I know of her personality. A kind of opulence amid an ingrained frugality. Taking mundane ingredients and making something unusual and pleasurable out of them. I can get behind that! Cheers to the memory of Great Aunt Margaret Nottke! Yes--I find it very compelling--though I'm sure that many families have similar tales of the Great Depression and how it derailed and altered lives and relationships. These background stories really help you understand how people became the kinds of persons they were.